The frog at the bottom of the well: Corrie Tan reviews Howard Barker’s In The Depths of Dead Love. In the Depths of Dead Love at the Print Room. Photo: Hugo Glendinning. As someone who translates literary work from Chinese to English, my currency is precision of language. Can I communicate what the author wants to say – not only in intent, but in tone? There are several schools of thought here: one could retain that “exotic flavour” of Chineseness in the text by valuing the literal over the literary; or one could translate the work such that it feels, in English, as close to the way it is felt in Chinese. When I was much younger, I would read abridged versions of Chinese classics such as The Water Margin or Dream of the Red Chamber (which is sometimes translated as A Dream of Red Mansions or A Dream of Red Pavilions). Many of these adaptations for young audiences came in both English and Chinese, and to my bilingual ears, the English translations would invariably sound verbose and clumsy – the original Chinese, sharp and succinct. I would come to realise, much later on, that many readers who only understood English largely assumed that Chinese was a florid language because of these literal translations, when in fact it was the prolixity of English that made it so. Chinese idioms, for instance, can be incredibly evocative in four choice words, when it might take several sentences to explain them in English. In In the Depths of Dead Love, playwright Howard Barker’s characters speak exactly like these over-literal, wilfully exotic translations. The suicidal Lady Hasi (Stella Gonet) visits the poet Chin’s “bottomless” well every day, hoping she might have the courage to take the leap and die. She describes her falling silk handkerchief and how it might land on her face “quite possibly like a fine scattering of snow”. Chin (James Clyde), who’s been commanded by Hasi’s husband Lord Ghang (William Chubb) to give her the push she needs, craves the sensuality of Hasi’s shoulders, shoulders “as frail as two twigs” that might have been braided together “by a solitary child in the forest”. The forced poetry in every line often feels like a ridiculous parody of how a non-Chinese speaker might imagine a Chinese speaker would sound like if Chinese were English. And even if the all-white cast had been entirely Asian, the sting of this artifice would remain. By setting a play in ancient China, Barker may argue that he’s employing a “distancing effect” by having “rarely ever set a play in my own culture”. The converse is also true, that by deliberately setting a piece in a specific place the audience is invited to bring to the production their cultural preconceptions and misconceptions of this location. The setting, Barker insists, is “entirely artificial” and “entirely European in its sensibilities” – in which case it seems puzzling to be so specific about the location at all. In fact, there’s a blatant disregard of any understanding of the Chinese language, where Barker toys with the words “push” and “shove” in English as a plot device and attempts to evoke some humour in the wordplay; in Chinese, the root word for both is the same (推; tui), which strips the puns of any meaning. While the Print Room at the Coronet wrestled with accusations of yellowface in its casting of this play, I’d argue that the problems here go beyond the choice of actors. It’s the deliberate decision to frame the play with a certain culture in mind, then to rely on the audience’s stereotypes about this culture’s people and history in order to propel the plot forward, and then to insist that this culture is merely a metaphor because “the theatre isn’t a place for literalness”. What makes a metaphor an effective one? Metaphor is often at the heart of the fable and the parable, the simple, sometimes whimsical or mythical stories that hold universal truths and draw unexpected parallels with our present realities. I’m reminded of the fable of the frog in the well, one of the first idioms that children learn (the idiom, in all its beautiful brevity, is 井底之蛙; jing di zhi wa, which expands to “the frog at the bottom of the well”). Popularised by the Chinese philosopher Zhuangzi (around the 4th century B.C. ), the story goes that a frog living at the bottom of a well believes that the circle of sky above it is the entire world – until a sea turtle arrives and destroys this complacency, regaling the frog with stories of the ocean and what lies beyond. The frog is left speechless. Jing di zhi wa is now often used to describe someone who is ignorant or narrow-minded about the world. Director Gerrard McArthur calls In the Depths of Dead Love a fable, but it’s really a faux fable with metaphor so thickly slathered, so artificial, so self-indulgent and aggressive in its search for the profound, with characters so thin I feared they would break. For a play that wrestles with mortality and confronting death, there are little to no stakes in the potential deaths of any of its characters. 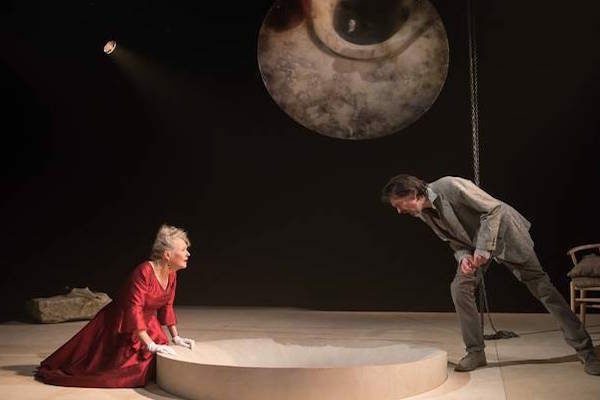 There’s a deliberate decision, a la Brecht, to expose the “bottomless” well in the centre of the stage as a shallow one of about two feet deep – but the production can’t seem to decide if this is a playful mockery of the suicidal act, or a serious visual aid used in several deeply emotional moments. The quartet of actors bluster and pontificate on the stage, doing their best to bring some energy to their conversations, but they can’t help that the protracted, trudging plot is mind-numbingly dull. Barker has wrapped himself so securely in his theory of “theatre of catastrophe” that any criticism of him might feel futile, as his deliberate intention is to baffle and disorient the audience and to revel in an audience divided, whose expectations are constantly undermined. I wish I had felt baffled and disoriented, I wish my expectations had been undermined; instead I was bored. My companion fell asleep for 10 minutes and woke to find she had missed barely anything at all. She had closed her eyes to get a sense of what the play might have been like in its first incarnation as a radio play, and concluded that the physical staging of the piece hadn’t added very much to it at all. I believe that theatre can and should transgress, should rupture boundaries and provoke its audiences to reassess themselves. But I think these profanations are also the most effective and revelatory when their creator has a deep understanding of the culture he is choosing to subvert. When these confrontations feel completely arbitrary, or rely on tired stereotypes, then the power of the provocation quickly fades away. After watching this play, I felt very much like the turtle gazing down with pity at the frog at the bottom of its narrow, dried-up well. In the Depths of Dead Love is on at the Print Room until 11th February 2017. Click here for more details.